From the time of early Polynesian settlement the ahupuaʻa of Kāneʻohe was a desirable place to live. With its fertile land and abundant water sources, it is estimated that the 1779 population of the Kāneʻohe Bay area was probably somewhere between 15,000 and 17,000 people. When foreigners began to settle in Hawaiʻi, Kāneʻohe was relatively isolated. The Bay did not provide a good anchorage and the trail over the Pali was treacherous. The American Protestant missionaries decided to open a mission in Kāneʻohe. Almost immediately they joined the Alexander and Armstrong families to open a mission in the Marquesas, on July 21, 1833. Their first and only son, Henry Hodges Parker was born there. They returned to Honolulu and were assigned to the “Kāneʻohe Station” on Windward Oahu. In 1835, Parker opened a school for 60 children; and another for men and women. The following year, he had 100 children. “(Parker) preached to large congregations; organized schools; taught classes; took long journeys either on foot or horseback to outlying districts, going from house to house, advising, helping, instructing his people; inspected the schools, guided the Hawaiian teachers; collected timber in the mountains for building purposes; superintended the building of churches and schoolhouses; planted trees; laid out roads; and directed the course of a stream of water from the mountains. The brook which runs its way in front of the modern public school is due to his foresight.” (The Friend, May 1933) He also helped survey the Koʻolau lands for the Great Māhele. Their three daughters were born at the Kāneʻohe Station, Mary in 1835, Harriet in 1837 and Caroline in 1840. All of their children carried on their parents work. Mary and Caroline were in charge of a boy’s reform school in Pālama. Their son, Henry became pastor of Kawaiahaʻo Church in 1863 and served in that position for 54-years. In 1848, Rev. Parker reported the foreign population of Koʻolaupoko to be only seven (one Swede, two Englishmen and four Americans) , three of whom were married , each having one child. One was a house carpenter and the others “cultivate the soil to some extent”. Following the Māhele, Parker acquired Koʻolaupoko lands, the ʻili of Lilipuna and other Kāneʻohe lands (over 55-acres total in 1851) and almost 650-acres of Waiheʻe, in 1855. By 1869 Parker owned all the land of Waiheʻe except for the kuleana lands. His son Henry formed the Parker Sugar Company and had about 80-acres in cultivation in 1880; they were only planters, the grinding was done at the nearby Kāneʻohe Sugar Plantation. In 1853, the Hawaiian Missionary Society reopened the Marquesas mission; Reverend Parker accompanied local emissaries in 1853 and 1867. Later in 1867, he retired and moved to Honolulu. He died in Honolulu March 23, 1877 at the age of 74. In December 1905, the Hawaiian Mission celebrated the one-hundredth birthday of Mother Parker, noting, “For many years you have remained the sole survivor of that large band of missionaries with whom you labored more than sixty-five years ago for the spiritual and social uplifting, through Christ, of these beloved Hawaiian people, while children who remember those early days have grown aged or gone on before.” Governor Carter came with congratulations, and a call from the former Queen was highly appreciated. In 1927, The Reverend Benjamin Parker School (originally called Kāneʻohe School) opened in Kāneʻohe, Oʻahu, on land donated by the Parker family. It is the first school in the Windward district. It started as an elementary and intermediate school, grades 1-8. Over the years, it expanded in size and grades taught; in 1937 it became an elementary and high school, grades 1-12. In 1951, when Castle High School opened, Parker reverted to an elementary school, serving grades K – 6. A fire destroyed portions of the school and it was reconstructed in 1973. The school currently serves about 330 students. 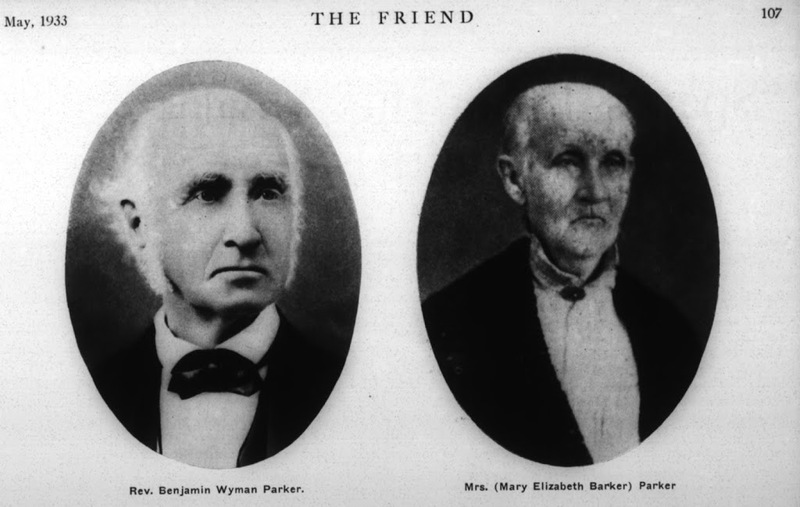 The image shows Benjamin and Mary Parker. Lots of stuff here from The Friend, Kāneʻohe: A History of Change and the Benjamin Parker School website. In addition, I have added other images in a folder of like name in the Photos section on my Facebook and Google+ pages.